During my formative years as a credit reading television viewer, one name above all stood for quality - Fielder Cook. The director of such classic TV movies as Earl Hamner's The Homecoming: A Christmas Story, Judge Horton and the Scottsboro Boys, A Love Affair: The Eleanor and Lou Gehrig Story, I Know Why the Caged Bird Sings, Will There Really Be a Morning? and more was always prominently featured in the TV Guide Close-Ups of yore. I later learned about that time before my own, the Golden Age of live television and discovered the basis of Mr. Cook's prominence and esteem. The former naval officer had a degree in literature from Washington and Lee University and studied Elizabethan literature in England, and in 1950 began his career in television with the popular anthology series, Lux Video Theatre. 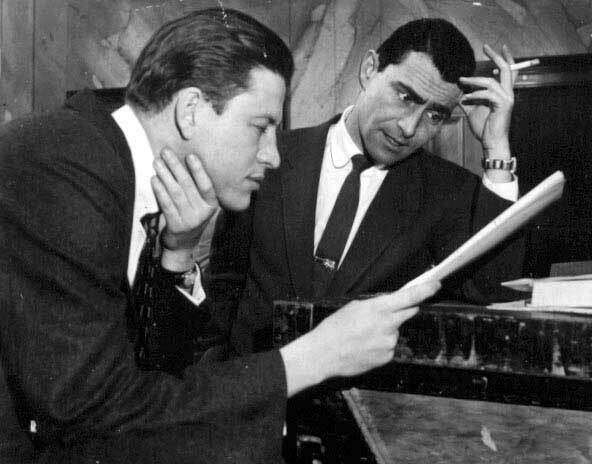 The program, which was a spin-off of NBCs Lux Radio Theater featured original teleplays along with adaptions of popular theatre fare and abridged versions of familiar movie titles. Cook's other credits in those heady days of the 1950s include The Kaiser Aluminum Hour, Omnibus, Playhouse 90 and Kraft Television Theatre. The January 12th, 1955 live episode of Kraft Television Theatre was the Cook directed episode of Rod Serling's Patterns starring Richard Kiley, Ed Begley and Everett Sloane. The program's success led to a repeat performance on February 9th and a 1956 theatrical feature directed by Fielder Cook with Van Heflin replacing Kiley. Moving from television to features was a career move made by many of Cook's contemporaries such as Sidney Lumet, John Frankenheimer, and Franklin Schaffner, yet Cook preferred to work in television where the word was king. "I went back to TV because I could do what I wanted to do. You learn from your mistakes with nobody telling you what to do." In an industry of so-called auteurs, the man was a radical as evidenced by his attitude, "As a director, I tell a story, but it's not my story." One story that gave Fielder Cook a lot of pleasure was a 1962 episode of the hour-long The DuPont Show of the Week written by Sidney Carroll called Big Deal in Laredo. The story concerns an annual poker game with Zachary Scott, Roland Winters, and John McGiver as high stakes players whose leisure and life is upended by the involvement of a pioneer couple played by Teresa Wright and Walter Matthau. 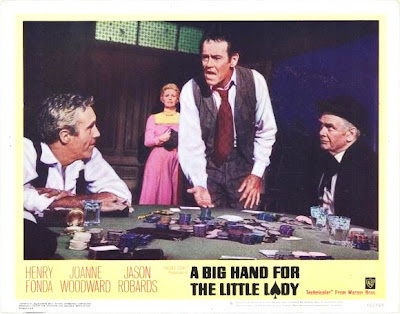 Carroll and Cook, under Cook's own production company Eden Productions Inc., revamped and released a feature presentation of the story renamed A Big Hand for the Little Lady. If you have seen A Big Hand for the Little Lady, you don't need me to tell you of its many delights. If you have not seen A Big Hand for the Little Lady, you don't want me to tell you too much of the delights awaiting you. Trust me on this, if on nothing else, the discovery is a joyful one you will want to make on your own. As a bit of an incentive, I will mention that the cast features a diverse collection of familiar and fabled actors including Henry Fonda, Jason Robards, Charles Bickford, Paul Ford, Burgess Meredith, Kevin McCarthy, Robert Middleton, and John Qualen. The "little lady" in question is the mesmerizing Joanne Woodward. Ms. Woodward was nominated for a Laurel Award from the Motion Picture Exhibitors in the category of Female Comedy Performance. The award was given to Julie Andrews of Thoroughly Modern Millie and one of the other nominees was Shirley MacLaine for Gambit which was also based on a Sidney Carroll story. The script for A Big Hand for the Little Lady is funny, exciting, moving and very, very real. TCM is showing A Big Hand for the Little Lady on Saturday, September 8 at 6:00 pm. I sincerely hope you find it a convenient time. Lovely post. I particularly warm to your mention of the revered TV Guide Closeups. Those were the days. I did not know about the TV forerunner of "Big Hand for the Little Lady", but I have wished often for showings of those 1950s and early '60s episodes of anthology TV shows. I suppose most were not recorded either on film or kinescope, but what a treasure if we could see them. Teresa Wright had a lot of great roles on TV in those days. She was the first Annie Sullivan in "The Miracle Worker", and also played photog Margaret Bourke-White. CW, I'm also a fan of BIG HAND FOR THE LITTLE LADY, so I heartily concur with your recommendation. I enjoyed learning about Fielder Cook; I was unfamiliar with him, but not with his work. JUDGE HORTON AND THE SCOTSBORO BOYS was one of the best made-for-TV movies of its era. I would love to see it again. JTL, somewhere there's a treasure trove of TV performances just waiting for us. TV Guide doesn't even publish in Canada any more, but long before it stopped, it wasn't the family bible it once was. Rick, your seconding of the movie is putting it on the way to being a ratings bonanza for TCM next week. I love a cast made up of practically everyone you ever saw all together in one movie. I liked how you said "a lot of delights" in this movie, and it's so true! I LOVE this movie -- it was a little gem discovery of mine years ago, when I didn't know about it. Wonderful cast and great story. Interesting background to it, too. Hey, I read your last article about going to court -- I've only been there once, and that was enough. Justice is indeed blind -- nobody seems to notice the victim! I've been told by friends I would make a lousy poker player because I have the world's worst poker face. But then I recently saw "The Cincinnati Kid" and really enjoyed it, so will give "A Big Hand for the Little Lady" a try. I've never seen this, C.W. And since I no longer get cable, it must remain unseen by me unless Netflix has it or I find it online elsewhere. I never would have thought to watch this, so thanks for letting me know. It sounds a delight. Not familiar with Fielder Cook either, until now. Though I know I've seen the fruits of his labors over the years.